Update, May 10: Wild West Online leaves early access and hits Steam today. Wild West Online will make its six-shooting Steam debut today, departing an independent early access phase to hit Valve’s store for the first time. The action MMO puts players in the roles you’d expect of the old west, from gunslinging cowboys to ranchers, farmers, and hunters, and brings a host of new content since its pre-release debut. Will Wild West Online make it on to our list of the best MMOs on PC? Chief among those new features is the faction territorial war, where you join one of two rival groups fighting for control of Willwood county’s resources. Faction members can join forces to control towns and territories, and further expansions for the system are on the way, including mines, train depots, and oil drills to fight over. You can take a peek at the faction system in the new trailer above. You can expect Wild West Online to hit Steam later today. Steam pre-purchases on the official website have been going for $29.99. Player response to the early versions of the game has been mixed, but we’ll soon find out how the final product fares. Original story, April 27:Action MMO Wild West Online is due to leave Early Access and launch on Steam on May 10, and there’s a brand new trailer which you can see above. It’s currently available to buy and play viathe game’s website. Anyone who gets it there will get access to the Steam version two days before it goes live, as well as cosmetic items for guns and characters apparently worth around $40. Players can pledge allegiance to one of two rival factions, with the goal of capturing territory to gain supplies. “Wild West Online has utilised community feedback to expand its features and gameplay in order to create a compelling western experience for its official launch on Steam,” say developers 612 Games. The Steam release will boast more PvE side missions and expanded activities, such as hunting, farming, and even brewing alcohol. There will also be special random PvP events that occur around the game world, in which players can compete to get rare items and other rewards. 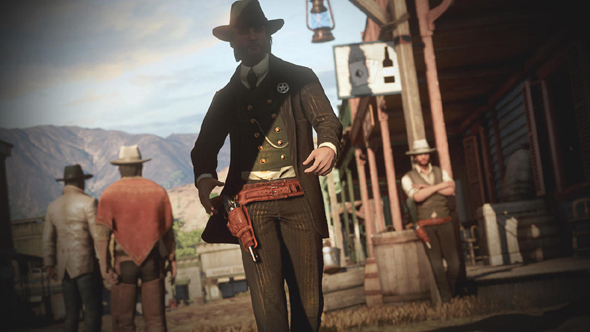 Wild West Online looks so much like Red Dead Redemption 2 a screenshot for the MMO was actually mistaken for it last year. With Rockstar’s game still not announced for PC, this could be our best bet for some cowboy action.